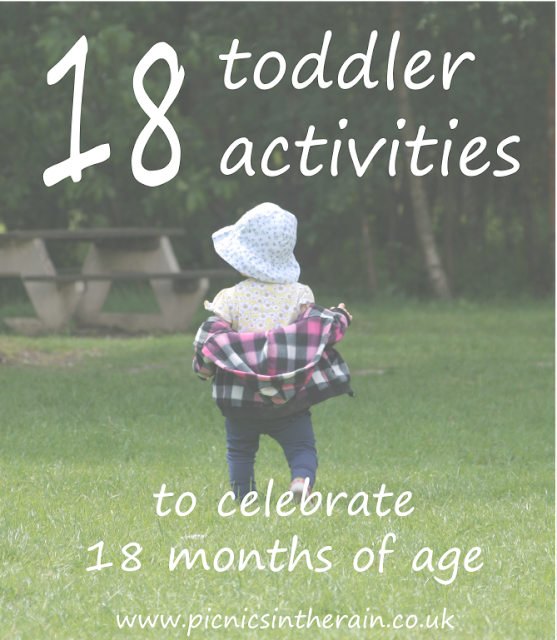 Rosalie turned 18 months old this week (how did that happen?! ), so I thought in celebration of that I would share some of the activities we get up to during our days together. At the moment Rosalie is still too young for me to set out specific activities as her attention span isn’t long enough, so our days usually involve several of these activities. 1. Playing with water – in a washing-up bowl, water table, the bath or the paddling pool; just add some cups, jugs, funnels, squirters etc. and she’s happy as Larry. 2. Playing with sand – digging, building and squashing castles and making patterns are all helping her discover cause and effect. 3. Going for walks – not only good exercise but the great outdoors provides so many opportunities for discovering shapes, sounds, smells and colours. 4. Going to the playground – a good way to encourage confidence and a bit of independence. 5. Exploring in the garden – especially watering the plants, keeps her happy and allows her a small amount of freedom as our garden is secure. 6. Playing hide and seek and chase – this usually brings the best giggles and is something Rosalie doesn’t seem to tire of, which is great for rainy days as you can play indoors too. We spend a lot of time singing, doing action rhymes, reading and looking at books together. All these activities are really important for babies and toddlers as they increase exposure to language and lay the foundations for all future learning. 1. Touchy-feely books and lift the flap books were great for getting Rosalie involved with books at a very young age, and she still loves them now to look at by herself. 2. Books that involve making silly noises are good fun for everyone! 3. Tongue twister books and story books with a good rhythm and rhyme are a fantastic way of developing language skills. 4. Singing not only provides me with another way to talk to Rosalie but also keeps me jolly and is a good way of distracting an impending toddler tantrum! 5. Action rhymes are such a brilliant way for toddlers to learn through participation, they also help develop memory skills and provide a simple way to play anytime, anywhere. 6. Using (magnetic) letters to spell out ‘Rosalie’ and talking about the letters and sounds throughout the day (as we walk past) is helping her to recognise her own name. Take a look at my What We’re Reading posts for some specific baby and toddler book recommendations. 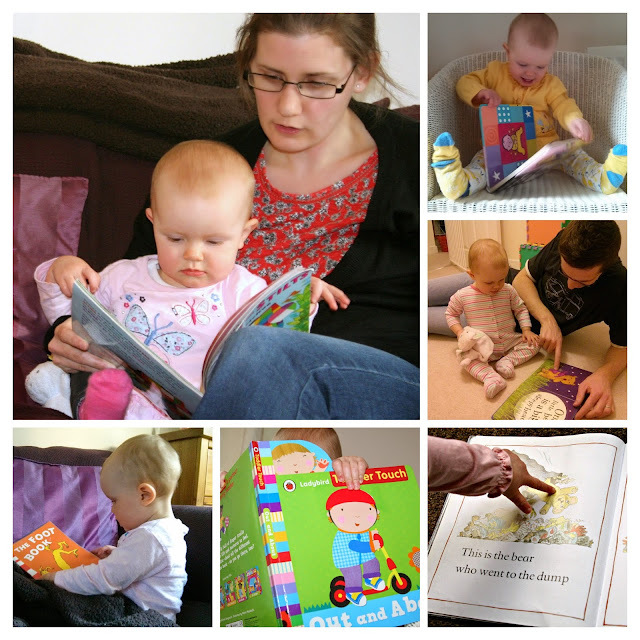 You might also like to read my top tips for introducing books to your baby. Rosalie doesn’t have a huge number of toys, but I think the ones she does have she really enjoys, and gets a lot of use out of. 1. Rocking animal – rocking herself and her teddies. Ours is low enough that she can get on and off by herself easily, and it’s plastic/wipe clean so is great for outdoors too. 2. Mega Bloks – building towers mainly at the moment, but we also use them to talk about colours and counting and provide opportunities for sorting. 3. 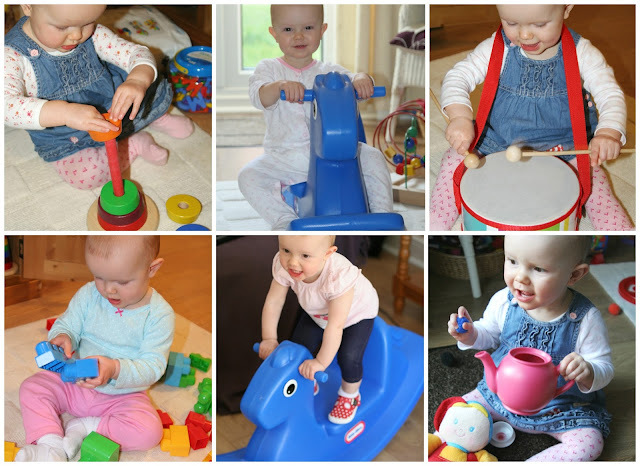 Stacking cups and rings – simple but effective, brilliant for hand-eye co-ordination, and also useful for colour recognition and counting practice. 4. Shape sorter – not only shape and colour recognition but great for hand-eye co-ordination too. 5. Tea set – Rosalie loves to pretend to make tea (with pom poms) and this tea set encourages her to share as she offers sips to her teddies, and me if I’m lucky! 6. Musical instruments – Rosalie has a drum, tambourine and several different types of shakers. Shakers are great from about 6 months old, and you don’t even have to buy them, I’ve made our own using bottles and small tubs filled with things such as rice and beans. 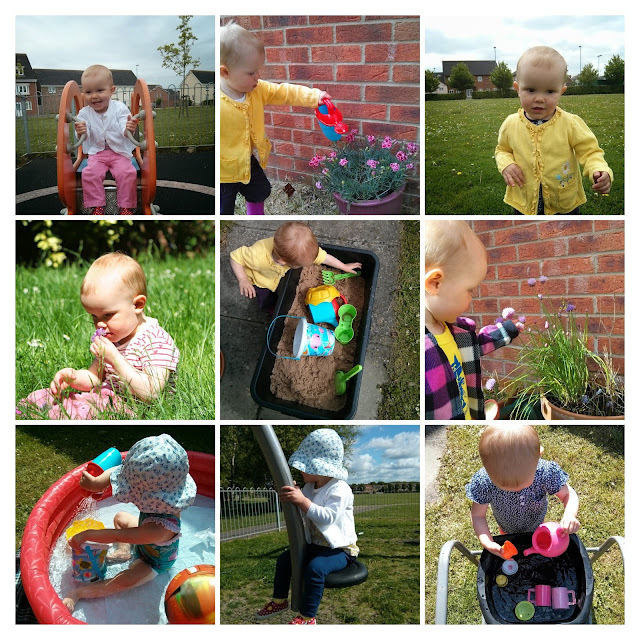 Of course there are many other things we get up to during our days, and with every week and month that passes I am able to add more variety to our daily activities, as Rosalie becomes more dexterous and capable. But for now, hopefully I’ve given you some idea of how we while away our days!